I often end up going by La Ventana (in El Malpais) around this time of the year; in fact, my very first post on this edition of New Mexico Photo Journal was of La Ventana. Looking at that post, I just realized the 10th anniversary of this edition of the blog was a couple of days ago — amazing! I would never have guessed I’d still be posting here regularly. In any case, this year was no exception; I visited La Ventana a few days ago. It was cloudy and fairly dark and I didn’t take any photos of La Ventana itself that I haven’t taken before. However, I did kind of go wild with the lichen there. I’ve been obsessed with lichens for a while now and have refrained from posting most of the photos as I’ve taken of them. 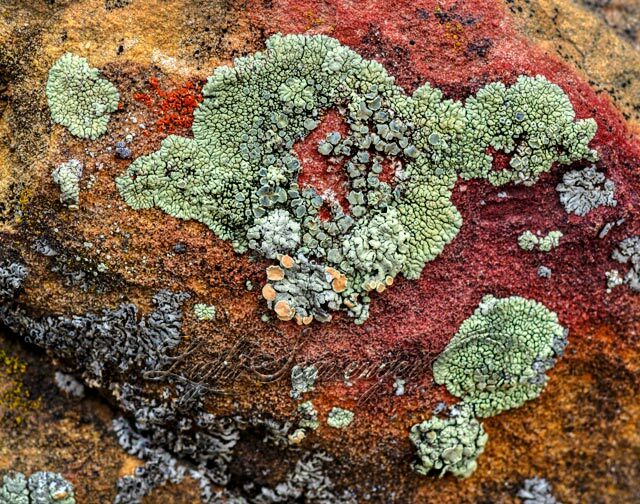 But I couldn’t resist this time — the colors and patterns of the underlying sandstone were so beautiful combined with the various lichens.